Uh-oh, it's the annual Schmidts' Christmas season yakety-yak-catch-up-fest. Read on if you dare. In amongst all the good, it was a sad year. Marc's Dad passed away in August not that long after being diagnosed with leukemia. In truth he had not been well since the end of last year - since they moved to an apartment in Swansea, near Newcastle. It took till about April to get a diagnosis, and they then moved to a retirement village/resort in Tea Gardens, Bob wanting Joan to be somewhere accessible, and with some support. We helped them move in July.. and barely 6 weeks later he died. Joan is coping very bravely, considering, although she has had some ups and downs health-wise. We just wish we were a bit closer. In that context, it's not easy to look back on the year with my usual naive enthusiasm and positive spin. Still, we have done some great things this year, and I know Bob would want us to keep on keeping on and enjoying life. We hit 2006 running - well, actually, loafing - around home and the beach.. with visitors having taken us up on our suggestion to come and stay at Casa Schmidt sometime. [*waves to my sister Lisa, Neil and boys, and Pete (old school mate of Marc), Linda and their mob*] It made us make the most of our beachside location, which we can sometimes take for granted.. and most days from Christmas through into the new year we made it to the beach twice a day, and then lolled around all beach-holiday-like during the heat of the day. We also acquired, around August, a bicycle built for three. No, the one in the xmas photo isn't photoshopped. It is indeed a triplet. And there's a a story and a half about how we got it. In summary: E-Bay. Lithuania. Yes. Lithuania. Bike won in beer competition. Never been ridden. Not much more than half the price of a new one (if you take account of freight + GST) from the States. Marc does side trip from KL - frequent flyer ticket to Vilnius, Lithuania - via Helsinki [*and meets up with Eliot & Jutta who are living there for a year! *] Has researched how to disassemble bike and package as air-friendly luggage. And puts it all back together again when he got home. Now proud owners of Co-Motion triplet. Envy of the tandem crowd. Envy of the two left over from '5 into 3' doesn't go. This time Cait has drawn the short straw of riding with Mum on the old green tandem, and it's the Dad, Ali and Zoe show on the triplet. As you can see by their tentative pose in the photo the girls don't usually ride it together. Yet! Actually, I forgot. You can never have enough tandems. 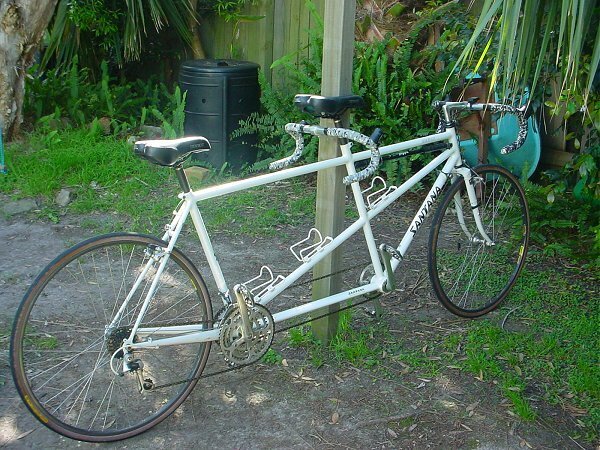 Earlier in the year we also bought us a road tandem on eBay.. from the US. (They make good tandems in the US.) A niiiiice Santana tandem, despite being a few years old. So far I have managed to keep it as the Him and Me machine, and we have managed to get out locally, sans kids, on a few decent rides. Muchly treasured 'together' time, plus I have discovered the joys of riding a road bike. ie. FAST! We now own four tandems plus a trailer bike, some of which we should probably get around to selling! And I keep looking wistfully at the Co-Motion, and wishing 'my' tandem was as 'nice'. . In non-bike related news, Marc made a lot of work trips to KL (plus a few other domestic trips) throughout the year. And the girls played a lot of netball. We went to Foster for one rep carnival, and invited ourselves to sleep at *Lizzie and Digby's* the night before.. turned out their daughter was involved in the rep netball as well. Cait's rep State Age was in Newcastle in July this year, so we used that opportunity to duck down to Sydney to a Swans match; left the younger two with the grandparents for a few days, watched 3 days of netball, and then put Cait on a train to Hornsby; helped with the move to Tea Gardens, test rode our new Santana, and invited ourselves to dinner at friends' we hadn't seen in yonks. In early August we finally bought that 4WD we've been talking about for a while, and we are gradually getting ourselves set up to do the camping thing we've been talking about - for a while. We did christen the canvas touring tent way back in April with a one night jaunt up to Washpool National Park (west of Grafton) - where Caitlin kept us awake all night because she couldn't sleep, and we got drenched on a bushwalk the next day. Loved it, can't wait to do it again. We've recently purchased 5 new tyres for the Cruiser, a cargo barrier; we have roof bars and roof pod on the list, and I am eyeing off a camp kitchen set up. We hope to get away somewhere for a few days in early January. And some more later in the year. When we aren't bike riding! The girls are pretty good... we keep them off the streets with their various sport and school commitments, and they are mostly! doing stuff to make us proud. I like to use this opportunity to talk up the positives as a change from my daily whinges that they drive me to drink and do my head in. 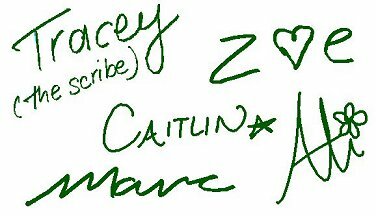 Cait was Year 8 this year. She doesn't seem to do much school work, but is keeping up appearances in the merit award stakes - and came in the top seven in the year, academic achievement-wise. She overdosed on the netball over winter with the rep.. but is back playing in a summer social twilight comp one afternoon, and spends a lot of time shooting goals in the back yard. She's also playing Touch in another summer comp. . Pity she hasn't kept up her swimming - came to one of my squads and I can outswim her now. Hah! She's finally grown - is just about as tall as me now.. and so seems to think the bossy boots of the house fit her now. Alison loves her netball, still swims, started Touch, and she's learning flute through school. (Thank god, one less thing to squeeze in after school!) One more year till she's in high school; scary. She just got voted onto the Student Council for next year. Our quiet one has really come out of her shell! She's cruising (possibly too much) academically.. and she's becoming pretty independent, riding her bike to school most days.. but I wish that would translate into being less of a Miss Mess. She is pretty much over sharing a room (with Zoe), and I guess I don't blame her. She's just been away on a 5 day school camp up at my old stomping ground, Lake Ainsworth; couldn't wait for that week to get here, and had a ball. Zoe and I ran in the 'social' Tuesday arvo cross country again, and got ourselves little bronze medallions for accruing so many points for turning up and gradually improving. Complete role reversal from a couple of years ago. She beats me round the course, and then gives me words of encouragement. She conned me into letting her do ballet again.. and we got through the end of year concert somehow (by getting a real Ballet Mum (TM) to do her makeup!) She now reckons that she doesn't much like getting 'goop' on her face; though whether that's just trying to be like her Mum is hard to say. She also did Nettas, has done Kids Touch over summer, and she had a lead role in the Infants Dept musical at the end of term: The Twelve Days of Christmas. She was "Me" ! I can't believe she's going to be in primary school - Year 3! - next year. She's a bright spark, but can still be a bit vague, a lot messy, and is learning how to get stroppy with her sisters. Three way mayhem.., add hormones and stir. Just great! Marc played in his Aussie mens over 40s Touch side against NZ (up in Brisbane) back in February, and tries to play Monday nights (and Wednesdays in summer) when he isn't away. He hasn't done himself too much injury this year, though just a couple of weeks ago he sprained his wrist, and copped yet another job to his ribs. (All on the touch field.) He still works way too hard.. (and is away much too often); this KL job is just about doing him in. Despite the constant promises, the working away doesn't change.. and we haven't yet figured out a solution to it. I'm still practising housework avoidance on a grand scale. My computer addictions have wandered off into the world of blogging - and I keep telling myself that it's writing practice for... something. (As is this annual bit of babble). With all the bike riding and swimming (I do two squads a week) I'm probably fitter than I've been in a while, but I'm still sabotaging myself in the energy-intake department. I tore a calf muscle earlier in the year (after the Big Ride, thankfully) which cramped my style just as I was getting enthusiastic about being fit and healthy. It got better in time for me to dust off my tennis racquet and play Ladies midweek tennis; it was good to get back into MY sport after a long hiatus. I'm still Secretary of the netball association, which I'm a bit "over" at this point in the year, but I will hopefully find some new oomph for it come January. In keeping with the 'catch up' theme for the year, I came home one day a couple of months ago to a note under my door from an old college friend, and I managed to find her at the local caravan park where they were staying. [*Hi Beth! *] And I finally had lunch with another school friend [*waves to Lyn*] in Grafton a couple of weeks ago. Told you it was the year for catching up! Poor old Rags went downhill kind of suddenly, despite what we were spending on arthritis and heart medication, and in the middle of the last school holidays we had to make the dreaded decision. It's pretty weird not having a dog around the place. She made it to 15 years old, though. Not a bad innings. Right now, with all our travelling, we're not rushing into getting another dog, although Alison will be hassling us about that pretty soon I imagine. Christmas for us this year is another Blue Mountains escapade; we've rented a holiday house there again for a week, and will spend time with Marc's mum and his sister at Blackheath. We are hoping to be able to take Alison on her first canyon.. which will depend on what areas didn't get burnt out by the recent fires. Marc had to go back to KL for this week before Christmas, would you believe. He gets back on Friday (then does his work xmas lunch) and I am trying not to panic about being packed and ready to leave here on the Saturday morning: we are rounding off the year with one more big catch up, landing on Andrew and Kim for Christmas Eve--Eve. We could probably spend days and days after new year catching up with everyone we know, but with Marc only taking a precious two weeks annual leave, we intend to hightail it back home to the beach, after spending NYE with my family. If we get our act together we might manage to get away for a night or two camping somewhere. Other than our grand bike riding plans for March, we have also decided to bite the bullet and make our house a bit bigger. A double garage, another bedroom, (a new bathroom) and a bit more living space downstairs are on the agenda. We are at the building designer stage, ready to draw up plans for builder's quotes. 2007 could be an interesting year. with new and old friends in 2007! PS. Check Cait's touch on some of the graphics this year! In-house graphics on tap. And.. I've got a new format family webpage happening at www.schmidtfiles.com. That links to photos, which I've been a bit slow with this year, because I've been blogging.. and a lot of photos are there. Marc has been at me to update the 'photo album'.. so I might get to that in January. If you're ever bored!